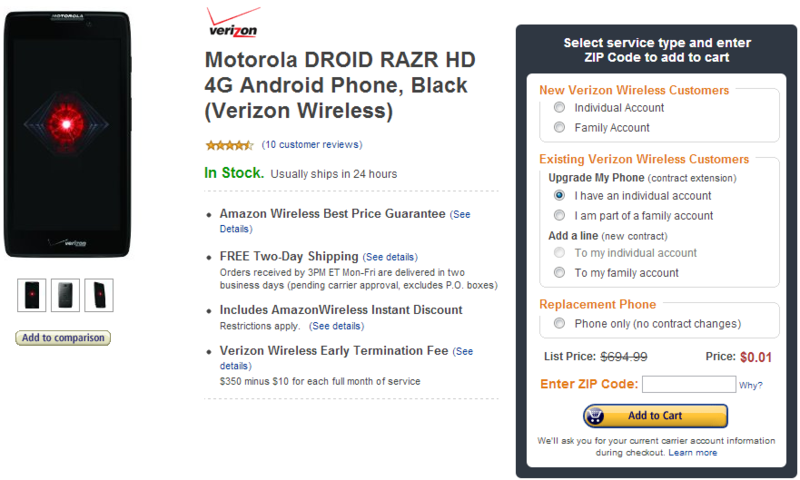 Just when you thought it couldn't go any lower, Amazon Wireless makes the Droid RAZR HD even more affordable. As long as you're willing to sign on for two years of Verizon service, that is. Amazon reduced the RAZR HD to $49 last week, but Wirefly leapfrogged Amazon to make the device free for upgrades (still $49 for new accounts). Not to be outdone, Amazon has dropped the price all the way to $19.99 on new accounts, and just $0.01 for upgrades. For anyone due for an upgrade on Verizon, getting this phone essentially for free is a great deal. Of course, $20 for new customers is nothing to sneeze at, and it does beat Wirefly's price. The Droid RAZR HD is still a formidable phone with a dual-core Qualcomm Snapdragon S4, a 4.7-inch 720p AMOLED screen, and a 2530mAh battery. The Droid RAZR MAXX takes the battery life crown, but the regular HD already packs more juice than most Android phones. There's nothing like a good old-fashioned price war between online retailers to get you a powerful smartphone at reduced cost. As usual, you've got your choice of both white and black versions of the device. Hit the links below if you're interested.